What a game on Friday! And what a contrast to two years ago! I travelled to Cardiff on Thursday and wrote an article about how the result of this game wouldn’t have much meaning when the two sides meet in the Rugby World Cup (see World Cup Year so important for Rugby in England)). However I should have said that the manner in which the teams played will be significant come the game in September. Two years ago England were overawed and outplayed, they seemed to lack leadership and the Welsh were completely dominant up front and in the backs. This year Robshaw’s calm defiance in the tunnel to stand up to the mind games set the scene for a complete turnaround. I don’t know what the WRU was trying to prove with the light show but it didn’t do a lot for me, and I think the England skipper was absolutely right to wait in the warm until the show was over. I was sitting somewhere above the players’ tunnel so my colleagues and I had no idea what was going on; we were just muttering about the delay and hoping the light show would end soon. The press had been very negative about England’s chances questioning whether with so many ‘first choice’ players injured they could hope to compete with a settled and experienced Welsh squad. But looking at the England team sheet it was difficult to point to any player’s name thinking that he shouldn’t be there. I suppose Courtenay Lawes and Joe Launchbury were the two stand out absentees, but Atwood and Kruis both had an excellent games and gave no reason to be dropped. This was a confident England with great strength in depth that looks to be peaking at just the right time. So that begs the question: What will Lancaster do when everyone is fit? A significant change from two years ago was the scrum. In 2013 the front rows were allowed to hit into each other which was the point at which you knew if you were going dominate your opponent in that encounter. Time after time Adam Jones and Gethin Jenkins got the better of their opponents and referee Steve Walsh penalised England repeatedly. 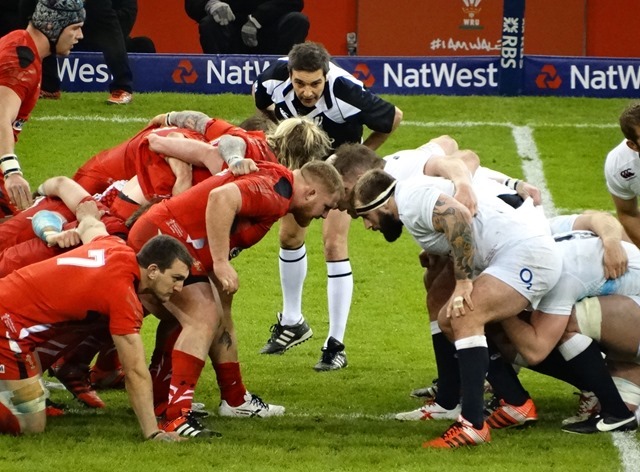 Then came a change in the scrummaging engagement sequence designed to minimise the hit and overnight the English props knew that they would be able to dominate any of their opponents. And so it has proved all this season and last with the English pack now regarded as probably the best in the world. They certainly gave the Welsh a tough time and it was their turn to concede the scrum penalties. The moment I will treasure from Friday evening was hearing Swing Low! being sung in the last 15 minutes of the match with the Millennium Stadium faithful unable to drown it out. This is the start of what will be an historic year for rugby in England. Related article: Why did George North stay on the pitch? Think it’s time to remember what we want from pre-match stuff. It would be great in my opinion if we had both teams run out onto the pitch, line up. Have a BAND play the anthems, without the need of some singer warbling her way across it – just let the crowd sing. Then play the game. All this pre-match light shows and stuff just gets in the way. That said Robshaw was right to stand in the tunnel, having to wait for the opposition on the pitch for 5 mins before the anthems is not acceptable and certainly not in the spirit of the game to expect them to do so.